My paternal grandmother passed away when I was five months old. My entire life I have heard stories about her life, about who she was, what she was like, etc. But, it unfortunately still left me what she might be and might have been if she had survived. My memory of her is zero, not sure what her voice sounded like or what her handwriting was even like. While home for the holidays, I was visiting with my grandfather and we were going through old photographs. I took some of them, scanned them in and have been slowly retouching out the dust, age, and color fades. In the process, I found this one of my grandmother when she was about 30 (image on the left). The image on the right (taken by my good friend Ariana Gomez http://arianagomez.com/ ) is of me just after my 25th birthday. 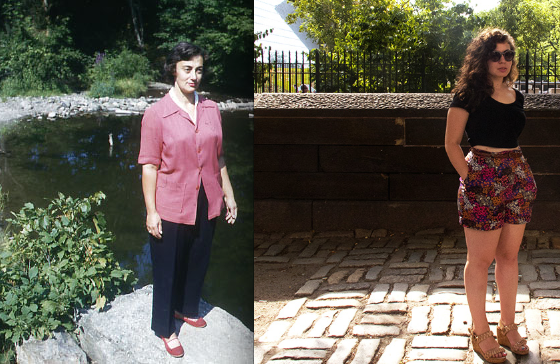 I think its amazing how our poses are almost the same, and although I am in Manhattan in my shot, and she is on vacation in upstate New York, the settings are similar as well. Beyond that, this was the first time in my life that I see how much I look like her. We have the same shaped neck and shoulders, same hair line/part, eyebrows, and lips. So, in a way, even though I have never known her, I am carrying her legacy on. I hope I am doing a good enough job.